John M Armleder designed the editions and invited the 31 artists of the Rubell Family Collection’s “30 Americans” exhibition to participate in the content of the bag. John M Armleder, Nina Chanel Abney, John Bankston, Jean-Michel Basquiat, Iona Rozeal Brown, Nick Cave, Robert Colescott, Noah Davis, Renée Green, Barkley L. Hendricks, Rashid Johnson, Glenn Ligon, Kalup Linzy, Kerry James Marshall, Rodney McMillian, Wangechi Mutu, Gary Simmons, Shinique Smith, Jeff Sonhouse, Henry Tailor, Hank Willis Thomas, Mickalene Thomas, Carrie Mae Weems, Kehinde Wiley and William Pope. Metal box with Spider icon designed by John M Armleder and red pencils imprinted with statements by artists of the exhibition “30 Americans”. Laminated offset prints on paper designed by John M Armleder with statements by artists of the exhibition “30 Americans”. Pre-installed Spider USB stick with a film by Jennifer Rubell featuring “30 Americans” artist. Linen bound double Spider notepad in offset printed pages designed by John M Armleder with reproduced scribbles, notes, reminders, sketches by artists of the exhibition “30 Americans”. 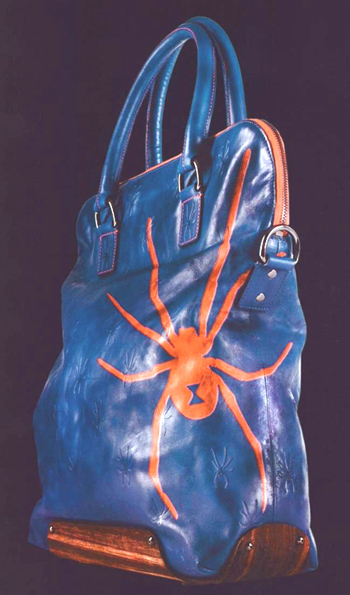 Leather embossed Spider pouch designed by John M Armleder. Leather holds for business cards. Metal Spider key ring designed by John M Armleder. T-shirt with red spider icon designed by John M Armleder. • Reality display map & certificate. Catalogue “30 Americans” of the exhibition at the Rubell Family Collection.